He also talked about how automation now isn’t to aid workers, it’s the automation and management of tens of thousands of servers. Maritz estimated that Google (s goog) has one person to manage about every thousand servers, as compared to VMware which has one person managing every 20 to 50 servers. Such a ratio is untenable if corporate IT wants to use its resources to do anything but run the infrastructure, which is why Maritz says about 90 percent of the vSphere code is about automation, not the hypervisor. 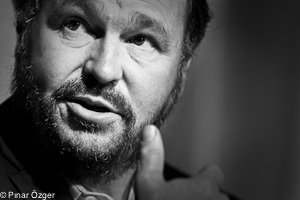 Maritz has taken other clues from Google, explaining that companies such as it and Facebook are the ones innovating and learning how to deal with the massive amounts of data created by consumers, generating an architectural change that will have to transcend consumer businesses and become an underlying element of the cloud. So when discussing the cloud, Maritz made a distinction between the consumer-oriented personal cloud where someone expects their information to be free and not tied to a device. For that cloud, questions about who owns the data and who has rights to it will have to be worked out, but the idea that data resides on a single device is over. The other cloud is around the reduction of complexity in the enterprise, which circles back to the points Maritz was making about scaling and automation. In general, Maritz may feel a bit melancholy as he watches his life’s work on client-server and PC-defined architectures fade, but he’s prepping VMware to shift to the future, one that asks less of developers and consumers and delivers a lot more at the infrastructure layer. I’m having a problem digesting the statement “VMware, the company that helped jumpstart the cloud with the creation of the hypervisor”. Hypervisors go back to 1967 (at least), “slightly” predating the PC. Cloud computing technologies in general go back to the 20th century (the analysts discovered them a few years ago and created the name “cloud computing”). Somehow we just can’t rewrite history that easily. If anyone can pull this off, its VMware! Love their products! We all know the current IT environment is changing, and everyone have their own thoughts and theories. Would have liked a bit more substance in the article though.